The Russian 5.45x39 caliber round has been around since the early 1970s, back when disco music was torturing all of us. 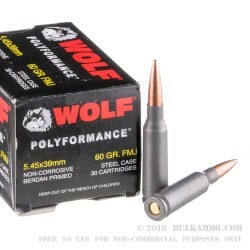 The WOLF Polyformance Ammunition line has taken the 5.45x39 cartridge to the next level. 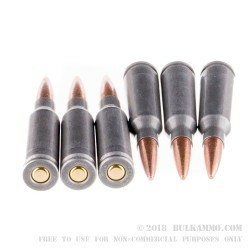 This 60 grain full metal jacket round is copper jacketed with a lead core and a non-corrosive, non-reloadable, polymer coated, Berdan primed steel case. The Wolf Polyformance rounds have a polymer coating on them that helps the round load, chamber, eject, and extract… even in bad weather. The Wolf 60 grain FMJ 5.45x39 rounds have a muzzle velocity of 2936 feet per second, and a heavy hitting muzzle energy of 1148 foot pounds. 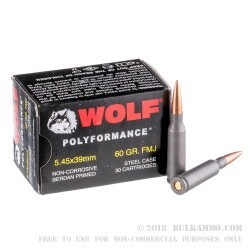 Wolf Ammo is also well know for its reliability and strength. This case of 750 rounds is a great addition to any gun safe and a perfect round to run through your AK74. The Russian 5.45x39 round was brought out in 1974 and introduced parallel to the AK74 platform that uses it. Over the years, the 7.62x39 AK47 round has quickly fell by the wayside, being replaced by the 5.45x39 cartridge. This round was designed and put into service after the Russians saw how well the American 5.56x45 cartridge performed in Vietnam and wanted to design an intermediate cartridge of their own. After a number of years of research and development, the 5.45x39 came to be.